Home DOST Mayon Volcano PHIVOLCS PHIVOLCS Update for Mayon Volcano, 13 February 2018. PHIVOLCS Update for Mayon Volcano, 13 February 2018. PUBLIC ADVISORY: Notice of raising Mayon Volcano’s status from Alert Level 3 to Alert Level 4 as of January 22, 2018. PHIVOLCS: MAYON VOLCANO BULLETIN 13 February 2018 8:00 A.M.
PHIVOLCS has raised the alert level to Alert Level 4 in effect over Mayon Volcano. The public is strongly advised to be vigilant and desist from entering the eight (8) kilometer-radius danger zone, and to be additionally vigilant against pyroclastic density currents, lahars and sediment-laden stream flows along channels draining the edifice. 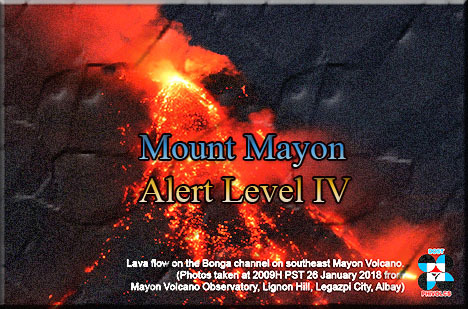 SUMMARY | Alert Level 4 remains in effect over Mayon Volcano. Mayon’s activity in the past 24 hours was characterized by sporadic and weak lava fountaining, lava flow and degassing from the summit crater. Although the upper slopes were heavily obscured, the seismic record indicated discrete episodes of lava fountaining that lasted three (3) to fifty-five (55) minutes. Throughout the night, lava flows and consequent incandescent rockfalls were observed in the Miisi and Bonga-Buyuan channels. Effused volumes of incandescent lava flows have advanced to 3.3 kilometers, 4.5 kilometers and 900 meters down the Miisi, Bonga and Basud Gullies, respectively, from the summit crater. Pyroclastic density currents or PDCs have deposited to the 4.6, 4.5 and 4.2 kilometer reaches of the Miisi, Bonga and Basud Gullies, respectively. A total of seventy-six (76) volcanic earthquakes, most of which corresponded to lava fountaining events were recorded by Mayon's seismic monitoring network.